Ya, I know ... it's been way more than 4 days. Call this Good Intention meets procrastination ! Beau opened this box, he thought he saw a wood roach and rushed it to the Garage, where he opened, and thankfully, reported it was bug free (not that bugs would hurt mosaic any; it is just the thought ... he did head off however, to spray the attic ... just in case). This is, of course, a Peg Wall Shelf piece. 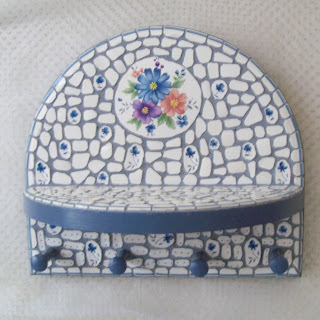 The first year or two that I worked mosaics, I had a tendency to craft functional items. Functional pieces are wonderful blocks to build skills upon. It is a real pretty piece, such a shame it's been in the attic so long. I'm going to list it on Ebay and if it doesn't sell (Ebay is not really a great place to sell mosaics), I'll put it in my shop.